Retail $6.99 SAVE 23% ! 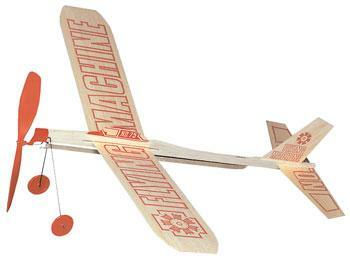 17" wingspan balsa wood airplane. Flight instructions printed on the bottom of the wing. Hand launched flights of 12-15 seconds and from 250-300 feet in distance. Rise-off-ground flights can be made from a smooth flying surface, including a 4" x 8' sheet of material. Glides to a smooth landing after the rubber motor bands unwind. Balsa construction pre-decorated with red print and graphics. Flight instructions are printed on the bottom of the wing.